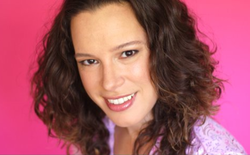 Jackie recently cast, produced, and performed in six AEA Benefits for Charity: Water. These shows include: The Rivals (Lydia), A Midsummer Night’s Dream (Puck),Cymbeline (Iachimo), Tennessee Williams one act: Talk To Like The Rain And Let Me Listen (Woman), Neil Simon’s Jake’s Women (Sheila), and an all-female production of King Lear (Goneril). Her favorite performance credits include Demeter in Cats, Belle in Beauty and the Beast, and Philia in Forum. She is the director and producer of www.presentdayproductions.com which presents a season of *One Night Only* benefits for The Ali Forney Center. Jackie also coaches privately in NYC.